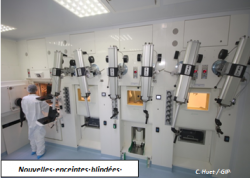 The objective in nuclear medicine (imaging and therapy) is to build up both a world-class research group and eventually a radiopharmaceutical industrial sector. This investment builds on existing strengths: the ARRONAX cyclotron and its multidisciplinary environment of academic and medical partners, dynamic local SMEs, the genuine start-up companies’ spirit of creation, a strong international cooperation and the recognized attractiveness of the Nantes region. This dynamic is actively supported by Atlanpole Biotherapies, one of whose priorities is radiopharmaceuticals. Atlanpole brings together all those involved in that sector, under the banner “Isotop4Life”, which is built around collective and industrial projects. This objective of building up both a world-class research group and eventually a radiopharmaceutical industrial sector, will be achieved with the backing of a national network of laboratories, which are likely to hold the key to the manufacturing of radiopharmaceuticals in experimental or clinical conditions.